The central government of Indonesia has designated Mandalika Resort Area, Kuta Village, Pujut sub-district, Central Lombok (Loteng), West Nusa Tenggara (NTB), as one of the Special Economic Zones (KEK) in the Master Plan for the Acceleration and Expansion of Indonesian Economic Development (MP3EI) Corridor V, Bali, NTB, and NTT. Mandalika Resort is thought to be the first 'Smart Resort' in the world. The concept of Smart Resort helps build communities, empowers natural resources of NTB, and is more environmentally friendly. The State Owned Enterprise (BUMN), PT. Bali Tourism Development Corporation (BTDC) has been assigned to manage this area, because it successfully developed the 350 ha international tourist resort of Bali Nusa Dua. The project is part of a new long-term plan for a period of 20-30 years. 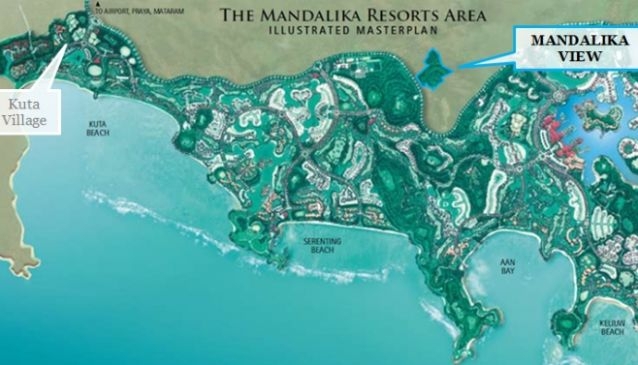 The President of Indonesia, Susilo Bambang Yudhoyono, conducted ground breaking for the commencement of construction of Mandalika Resort in 2011. There are three companies of international scale involved, PT. Land Tbk and PT MNC Gobel International and Club Mediterrane (Club Med) which will develop the region. Club Med is a French company engaged in resort development and has branches all over the world, usually in exotic destinations. It is owned by Henri Giscard d'Estain, the son of former French President Giscard d'Estain. Mandalika View is located on the South Coast of Lombok on a gently sloping hill, on prime land around Kuta, offering spectacular views of the Indian Ocean and surrounding rolling hills. It is only 20 minutes from the new Bandara International Airport near Praya. Kuta, the central town in South Lombok, offers the most extensive amenities in the South, and acts as a perfect base to explore all the magnificent South Lombok Beaches on newly paved roads. Mandalika View encompasses 17 plots which vary in size from 1100 to 2300 sq.m ideally suited for the development of villas with 2-5 bedrooms. The property on one side overlooks the bay of Kuta with the Mandalika Resort Area and with its proposed golf course right in front of it, ensuring the tranquillity for a holiday home. On the other side of the hill, the plots are facing Tanjung Aan Bay's white sand beaches and unspoiled scenery. The development is connected to a main access road linking East and West Lombok. Water and electric utilities are available at the nearby access road. Private Sanctuary offers turn-key solutions including design, project management, construction and operation of your dream villa. The best of Lombok is found on the south coast, in pristine beaches flanked by secluded coves and dramatic rocky headlands. Mandalika Resorts Area in Kuta will use these spectacularly beautiful spots as the backdrop to an enchanting resort complex of global appeal. The rolling hills that provide a verdant backdrop to the Mandalika Resort have been set aside as a conservation area. The 3000 hectares are home to many of the endemic species of Nusa Tenggara. A system of trails and guideposts will open the area for hiking, bicycling, and other low-impact activities. Mandalika is a short drive from both the new international airport and the automobile ferry terminal. The area is well served by telecommunications networks. Medical, banking, and other facilities are located in the capital, Mataram. Having spent two decades living and traveling in the world's metropolitan cities, the founders of Private Sanctuary realized that with the work hard - play hard attitude there is little reprieve in terms of a work life balance for high powered executives and businessmen. Being in a position to just sit back, relax, enjoy the moment and reflect, becomes a luxury few feel they can still afford in our 24-7 world. Private Sanctuary believes there is more to life and both your home and home away from home should be your own Private Sanctuary where you feel you are living your dream. We help you conceive your dream both at home to unwind from hard day at work or a long business trip or a holiday home based on some of the nicest spots in the world which our team has scouted for you, with dream locations, dream activities and dream amenities. We help you develop your dream home or home away from home with our team of seasoned architects and designers. We help you promote your dream for others to enjoy, for you to live free of financial worries on how to sustain the dream. Please contact us for more information on how we can make your dream become reality.